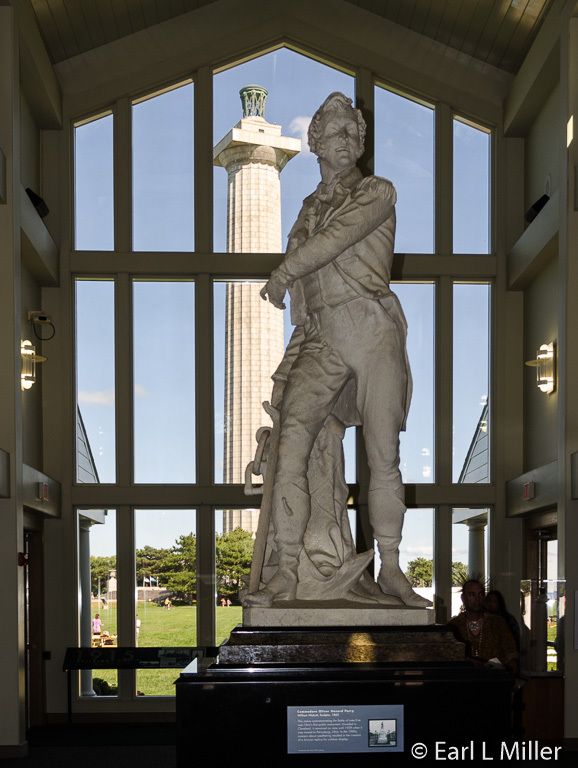 ​The Perry's Victory and International Peace Memorial, located on the edge of downtown Put-in-Bay on South Bass Island, can be seen for miles as it rises 352-feet above Lake Erie. It’s the third tallest monument in the United States’ National Park System. Because of its flashing beacon on top, it serves as a navigational aid and is considered a Lake Erie lighthouse. It, however, doesn’t fit into a typical lighthouse classification. The memorial commemorates Oliver Hazard Perry and those who fought during the Battle of Lake Erie. It’s also a symbol of 200 years of peace between Canada and the United States. That’s signified by the Union Jack, Canadian, and American flags flying together at the site. It can only be reached by air or by taking one of two boat lines to the island. 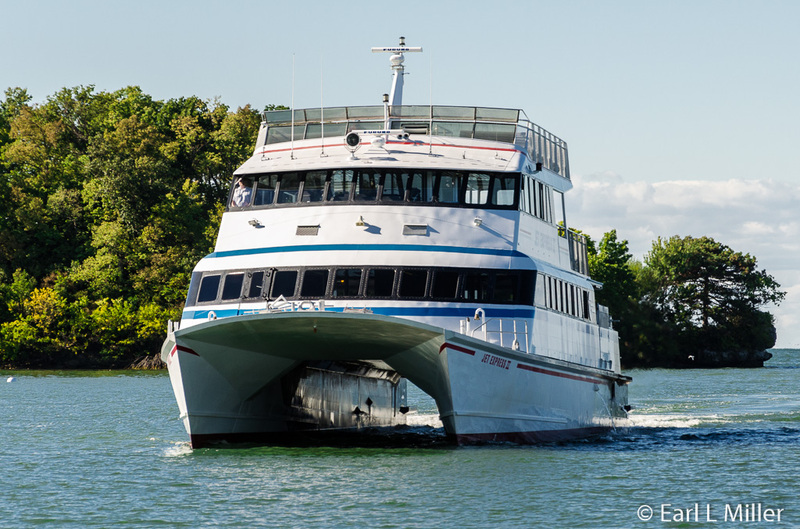 We found the quickest way was to take the Jet Express from Port Clinton to Put-in-Bay. Once there, it’s wise to rent a golf cart or bicycle from one of the island’s vendors. Prior to the battle there had been a competition between the United States and British Canada for controlling the Northwest Territory around the Great Lakes. As a result of this conflict, the United States declared war against Britain, the world’s greatest naval power at that time, on June 18, 1812. Soon afterwards, America discovered that it was not prepared for military action. The British quickly repelled attempts at Detroit, Niagara Falls, and Montreal to overwhelm Canada. In addition, English forces took Mackinac Island, and their Native American allies, primarily Potawatamies, conquered Fort Dearborn (later called Chicago). To answer British advances, James Madison’s Secretary of War, William Jones, ordered the construction of the U.S. naval fleet. In the autumn of 1812, the Commander of the U.S. Navy on the Great Lakes, Commodore Isaac Chauncey, assigned Master Commander Oliver Hazard Perry to take charge of the operation. Perry’s fleet was mostly constructed by hand at Erie, Pennsylvania. Pegs were used instead of nails since nails were in short supply. Since sawmills were nonexistent, lumber was cut by hand. Most of Perry’s experienced boat builders, shipwrights, and laborers came from Pittsburgh and Philadelphia. Iron, sail canvas, rigging, and cannon shot were brought in from Pittsburgh. Guns primarily came out of the Washington, New York, and Sacketts Harbor Naval Yards. The heaviest armaments were from Chesapeake Bay. Noah Brown, a New York shipbuilder, was hired to complete the work. Brown designed the two brigs, Lawrence and Niagara, as well as a smaller sloop and gunboats that would be used during the battle. Although England had maintained control of Lake Erie for more than a year, the British faced problems. Perry’s fleet on the lake disrupted England’s supply route via water from Fort Malden, opposite Detroit, to Long Point, Ontario. Since Fort Malden’s rations and supplies were getting scarce, the choice was to fight or abandon the fort. In early September 1813, the British flagship Detroit was completed and ready to sail. 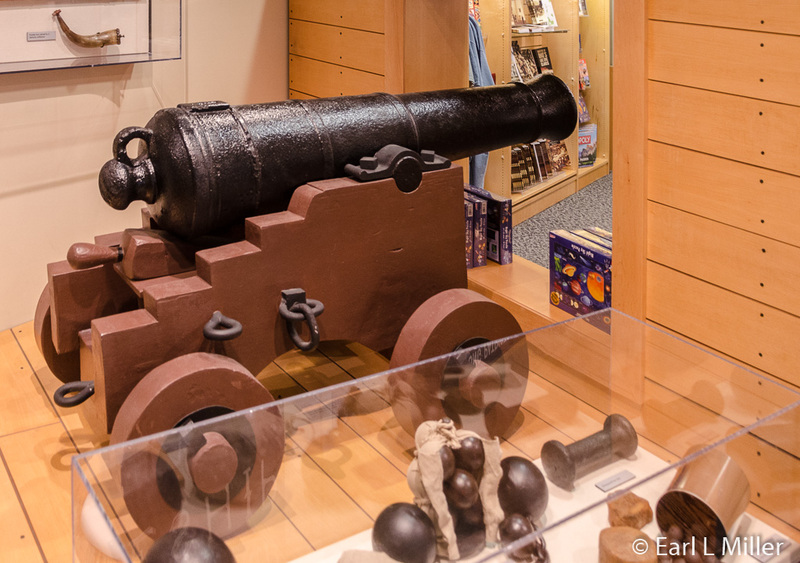 Her guns were a variety of weights including ones capable of firing 24-pound cannonballs.The Brits opted to fight. During the afternoon of September 9, a flotilla of British ships floated down the Detroit River and into western Lake Erie. The squadron consisted of six ships with 63 cannons that would face nine American vessels with 54 guns. The American brigs primarily had carronades with less than half of the British’s long guns’ range. Their carronades could cause more damage at close range. Perry needed the wind at his back to close within carronade range. When Perry’s ships sailed from Put-in-Bay’s harbor at 7:00 a.m., they steered west-northwest since the wind blew west-southwest. For more than two hours, Perry tried, without success, to tack his ships to put the wind to his back. Suddenly, at 10:00 a.m., the winds shifted, blowing from the southeast, placing the wind directly behind the Americans. He and his crew proceeded toward the British flagship. Just before the battle, Perry hoisted his battle flag on the Lawrence. It was a large, black, cotton fabric banner on which had been sewn in white stitching “Don’t Give Up the Ship.” These had been the dying words of Captain James Lawrence, Perry’s friend, who was killed on June 1, 1813. Perry’s ship had been named after this captain. He also spread sand on the decks and placed water by the guns to put out fires and extinguish thirst. 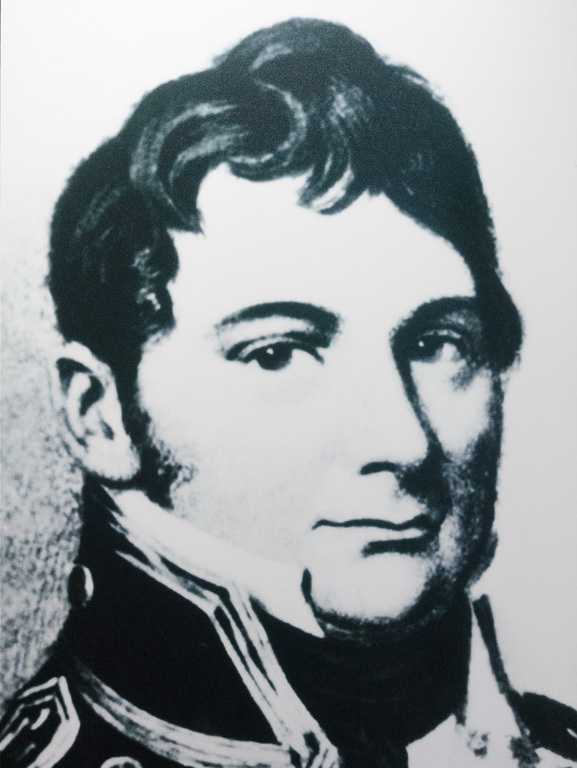 Commander Robert Heriot Barclay, an experienced Royal Navy officer, was Perry’s opponent. In 1805, Barclay had fought with Lord Nelson at Trafalgar. He lost an arm in a fight with a French convoy in 1807. When the wind shifted, Barclay’s options did not change. He pointed his fleets’ bows westward and drove them into the battle. Shortly before noon, as the American ships closed to within a mile, Barclay ordered the Detroit to fire a 24-pound ball. It landed harmlessly into the water at 11:45 a.m. However, a few minutes later, the second 24-pound ball smashed through the Lawrence’s bulwarks. The schooners, Ariel and Scorpion, were placed off the Lawrence’s bow to engage the first British vessel and to prevent the enemy from raking Perry’s fleet. The Lawrence, Perry’s flagship, was third in line and took on Barclay’s Detroit. Next came the Caldonia, a small brig with only three guns. For half an hour, the Detroit’s long guns shredded the Lawrence. Cannonball and flying splinters felled many of the Americans. Eighty percent were killed or wounded. Since the Lawrence’s cannons were still out of range, Perry ordered the Scorpion with one long 24-pounder and the Ariel with four long 12-pounders to open fire. Thirty minutes later, Perry still struggled to get within firing range of the Detroit. At that time, the whole British fleet took aim at the Lawrence causing it to become a total wreck and go dead in the water. The British cannons had proved much more accurate than the American guns at long distance. The Niagara, under Jesse Elliot, was slow to come into action and remained far out of effective carronade range. Supposedly, this ship was under Perry’s orders to engage the 17-gun Queen Charlotte, Britain’s second largest ship. Instead, since it stayed out of range, the Niagara was relatively undamaged. For many years, Elliot’s actions were a matter of dispute between him and Perry. Commodore Perry, who was physically unscathed throughout all of this, abandoned the Lawrence. 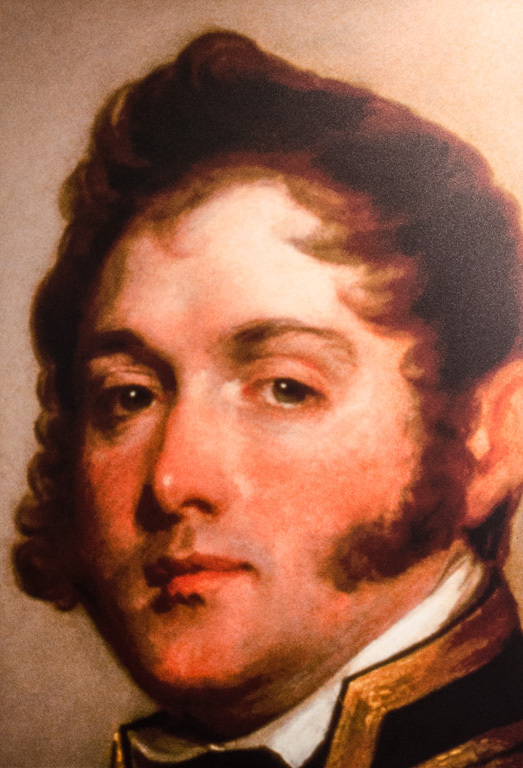 He took down his battle flag, collected his five remaining able-bodied seamen, and rowed a half mile through a barrage of gunfire and cannonballs to the Niagara. When his rowboat was hit by a British cannonball, he tore off his uniform coat and stuffed it into the hole to keep the boat afloat rather than sacrifice his battle flag. When the Lawrence lowered its colors, firing briefly ceased. As the British saw the Niagra closing against them, the Detroit and Queen Charlotte tried to turn to expose unused cannons. They collided, tangled their riggings, and were no longer in action. Most of the smaller British ships were also disabled and drifting to leeward. The captains and first lieutenants of every British ship, including Barclay, were severely injured or killed. British junior officers, who lacked experience, assumed control of their ships. Upon the Lawrence’s surrender, the British expected the Niagara to lead the remaining American ships away in retreat. Instead, once aboard the Niagara, Perry raised his battle flag, took command of this ship, and sailed toward the Royal British line. It was at this point that the Americans started to win. Niagara broke through the British line ahead of the Detroit and Queen Charlotte. It unleashed broadsides from ahead of them while the American gunboats fired from astern. American sailors fired their rifles at British seamen. The British fleet surrendered, one by one, within fifteen minutes. By 3:00, the battle was through. Two British gunboats attempted to escape, but they were chased down and captured. The battle left 22 Americans dead and 96 wounded along with 41 British killed and 94 wounded. Three officers on each side were buried at Put-in-Bay. The sailors on both sides were committed to the sea. The Battle of Lake Erie is regarded as one of the most important battles of the War of 1812. It led to the American control of the lake. It also forced the British to abandon Detroit and retreat up the Thames River to Canada. On October 5, 1813, General William Henry Harrison’s army decisively defeated the British and their Native American compatriots at the Battle of the Thames. This was the battle which cost Tecumseh his life. The war’s victory ensured that the Northwest Territory would remain in the hands of the United States and that there would be peace along the longest demilitarized zone in the world. The Lawrence was restored to service in 1814. In 1820, it and the Niagara, because they had rotted, were intentionally sunk near Misery Bay in Lake Erie. The Lawrence was raised in 1875, moved to Philadelphia, and displayed at the 1876 Centennial Exposition. She burned later that year when the pavilion where she was housed caught on fire. The Niagara was raised and restored in 1913 but fell into disrepair. She was eventually disassembled. Portions of her were used in a reconstructed Niagara which is now on view in Erie, Pennsylvania. Although public enthusiasm was present sooner than 1910 for building a memorial, the funds were not generated until that year. The Ohio General Assembly originally purchased the park’s land then ceded title to the United States government in 1919. Work on the project started in October 1912 when Webster P. Huntington of Ohio led the joint effort of nine states and the federal government. On July 4, 1913, the cornerstone was laid. By April 20, 1914, the monument rose 30 floors. 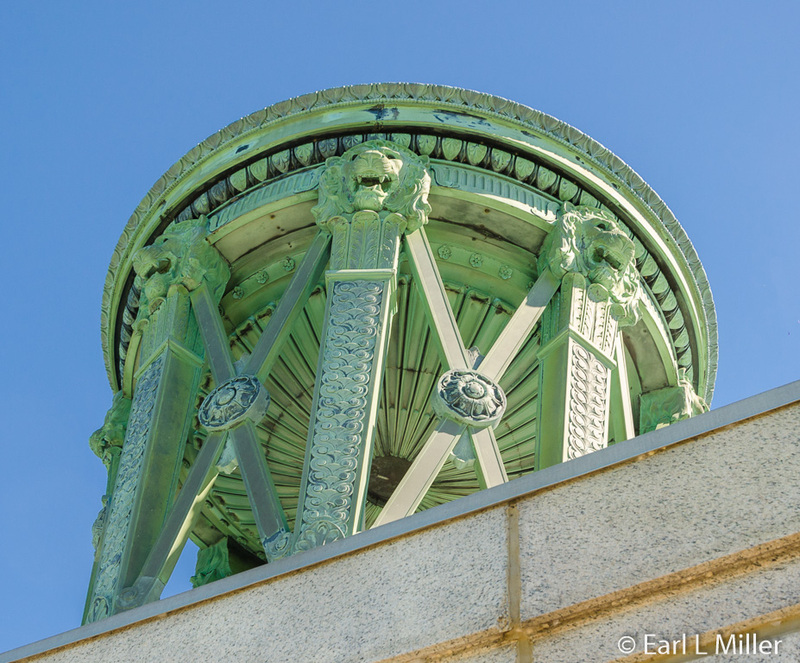 Work started on the observation deck in late 1914, and its 23-foot high, ornamental, bronze urn was installed in the summer of 1915. On June 13, 1915, although unfinished, the memorial opened to the public. It took more than a decade to complete the plazas, seawalls, and landscaping. In 1936, President Franklin D. Roosevelt declared it a national monument. While in 1972, its name changed from Perry’s Victory Monument to the Perry’s Victory and International Peace Memorial. The 352-foot column, the world’s most massive Doric column, is composed of 2,400 pink granite blocks. The upper deck platform is 12 feet higher than the Statue of Liberty’s torch. Only the Gateway Arch, San Jacinto Monument, and Washington Monument are taller. It’s also the only international peace monument in the United States National Park System. 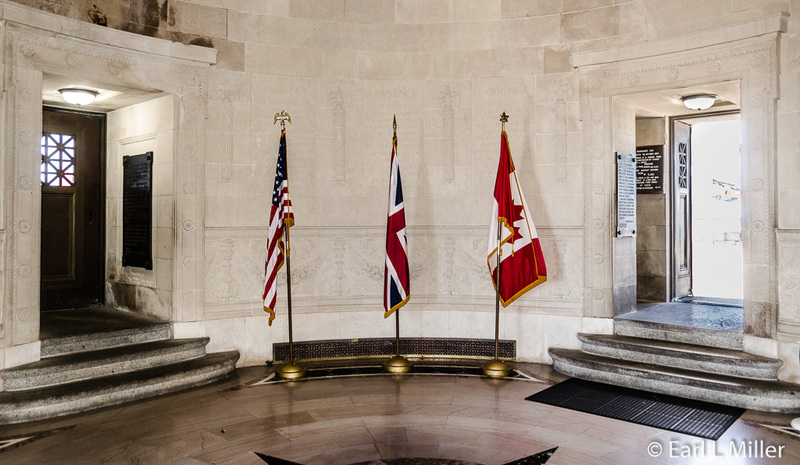 Interred beneath the rotunda floor are the remains of the three American and three British officers who were killed during the Battle of Lake Erie. Their remains were originally located in the village of Put-in-Bay but were removed and reinterred in the monument’s crypt on September 11, 1913. The names of Perry’s vessels and those of Americans killed or wounded during the battle are carved into the rotunda walls. 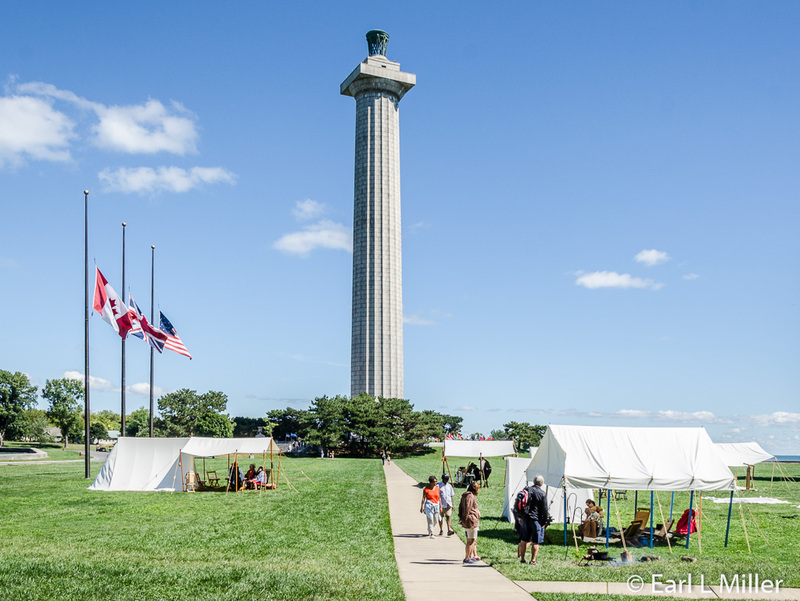 From mid May into October in 2016, park rangers provided interpretative talks on such topics as the Battle of Lake Erie, the War of 1812, and the memorial’s construction. These were given on the plaza at the memorial’s base, from Monday through Thursday, at 2:00 and 4:00 p.m.
During weekends, rangers give living history demonstrations. Dressed in 1812 military attire, they fire reproduction flintlock muskets and rifles. 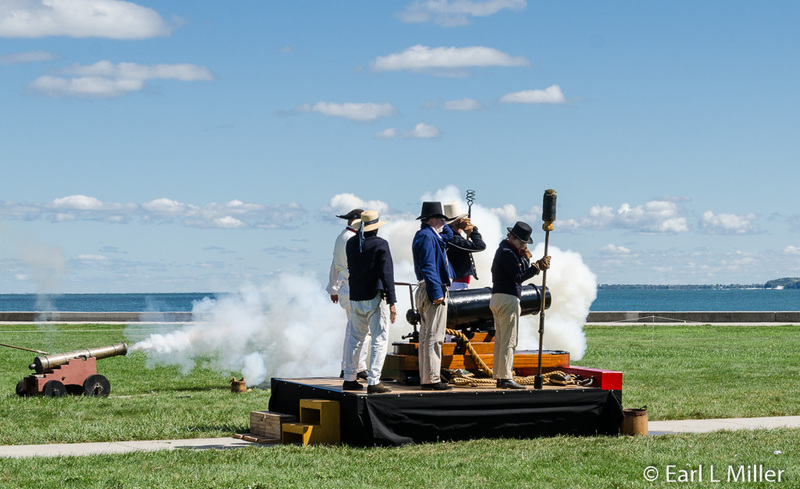 On some scheduled weekends, firing demonstrations of 32-pound carronades occurs. Visitors can climb 37 steep steps to the elevator. It ascends to the observation deck with its 360-degree, panoramic view of the Lake Erie Islands and the shorelines of Ohio, Michigan, and Ontario. 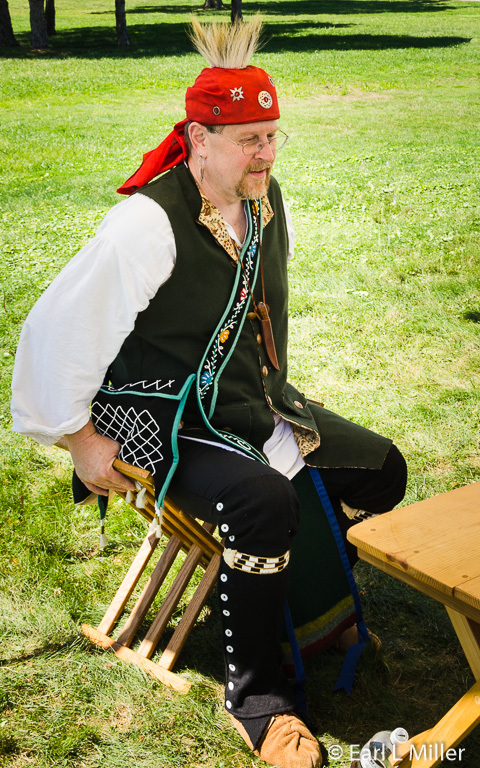 Sometimes a ranger, on the deck, points out what you are seeing and answers questions about the battle. In 2016, the elevator fee was $5, cash only, for those over the age of 15. In 2017, plans are to close the monument. The park system will redo grout on all the granite blocks comprising this structure. 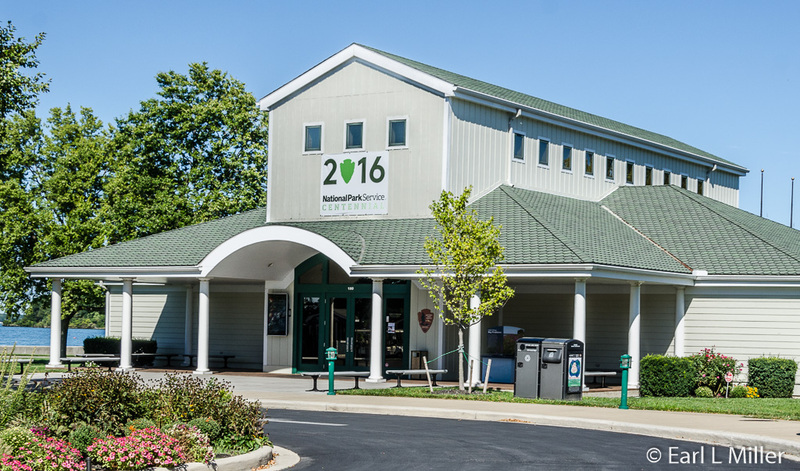 Park rangers will conduct programs at the back porch of the visitor center. These will take place on the hour between 11:00 a.m. and 5:00 p.m.
A short stroll from the memorial is the monument’s visitors center. It contains a small movie theater, exhibits, a gift shop, and public restrooms. Its 15-minute movie on the battle’s history is available upon request. Just ask the ranger on duty to see it. The center will remain open in 2017. At the center, parents find out about the free Junior Ranger activities. These help youngsters explore and learn about the park. In 2016, these occurred daily at 1:00 p.m. For 2017, junior ranger programs will continue with youngsters participating in as many as they choose. Subjects will be on the Great Lakes restoration, Perry’s victory, the history of the memorial, and submerged objects. Submerged Objects covers how seawalls provide protection, offshore reefs, and shipwrecks. Among the exhibits are three historical paintings of the battle; cannon, shot, and muskets; and paintings and information about the commanders on the United States and British sides. You’ll see wallboards on the battle’s strategy, the types of ships involved, the memorial’s construction, and the establishment of peace. In one case, you’ll see postcards of the battle and a silver service given to Perry. The wood fragment you’ll spot is from the U.S. schooner Porcupine. What draws attention is the huge diorama in the room’s center portraying the location of all the ships during the battle. Near it are pictures of uniformed sailors and soldiers from both sides. The centerpiece is the statue of Perry shaped from a block of marble from Carrara, Italy. It’s nine feet tall, not including the base, and was designed and carved by William Walcott of New York to honor Perry with a public statue. It was first displayed at Cleveland’s Public Square accompanied by smaller statues of a young midshipman and a cabin boy placed on either side at Perry’s foot. 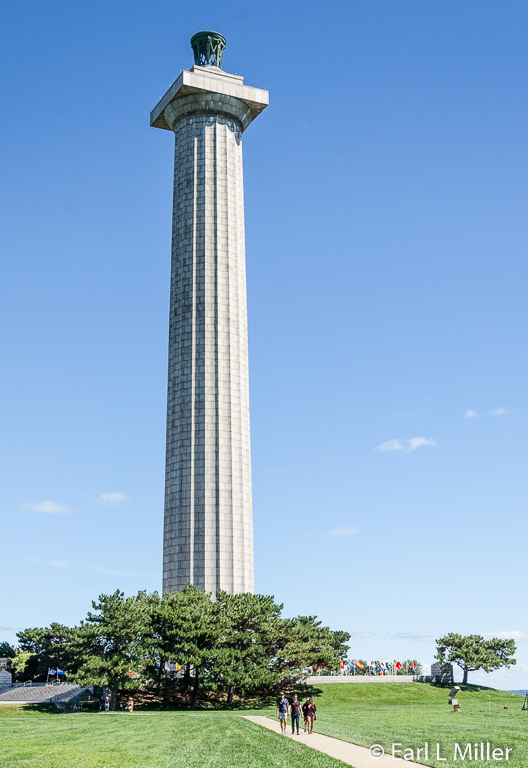 When it was unveiled on September 10, 1860, in Cleveland, some 30,000 people attended including Perry’s son and surviving veterans of the naval battle. Perry was not present as he had died at sea of yellow fever in 1819. When time and the weather had taken its toll on the marble statue, two bronze replicas were created. One was given to the state of Rhode Island where Perry was from and is buried. It stands just outside the capitol building in Providence. In 1929, when Cleveland looked for a home for the original marble statue, the city of Perrysburg, Ohio (just south of Toledo) asked for it. As the town failed to have the money to erect it, it was placed in storage until 1937. Then it was placed in a small park in the center of Perrysburg. A bronze statue, which is a replica of the original marble statue, is in Perrysburg today. By 1966, the concrete around the original statue was falling into disrepair. It was taken down. The statue was placed on a granite pedestal and the smaller figures moved to the Municipal Building’s courtyard. In 1996, the two figures were duplicated in bronze, and on Memorial Day, 1997 new bronze statues were raised at the foot of Louisiana Avenue. The original marble statue of Perry is now on loan by the city of Perrysburg to the National Park Service. Visitors can view it at Perry Monument Visitor’s Center at Put-in-Bay. The smaller statues of the cabin boy and midshipman reside in the lobby of Perrysburg’s Municipal Building on West Indiana Avenue. The second 2013 coin in the United States Mint America the Beautiful Quarters® series was the Perry’s Victory and International Peace Memorial Quarter honoring Ohio’s national site. It was released into circulation on April 1, 2013. The design features the statue of Perry with the Peace Memorial in the distance. Inscriptions are PERRY’S VICTORY, OHIO, 2013 and E PLURIBUS UNUM. On the reverse side is the image of George Washington which is included on all America the Beautiful Quarters. The visitor center and film are free. They are open daily during the operating season of May through October. It opens at 10:00 a.m. and closes at 5:00, 6:00, or 7:00 p.m. depending on the month of the year. The most expedient way to get to Put-in-Bay is by Jet Express, a 35 minute catamaran ride, from Port Clinton which costs $36 apiece. Parking is $12. 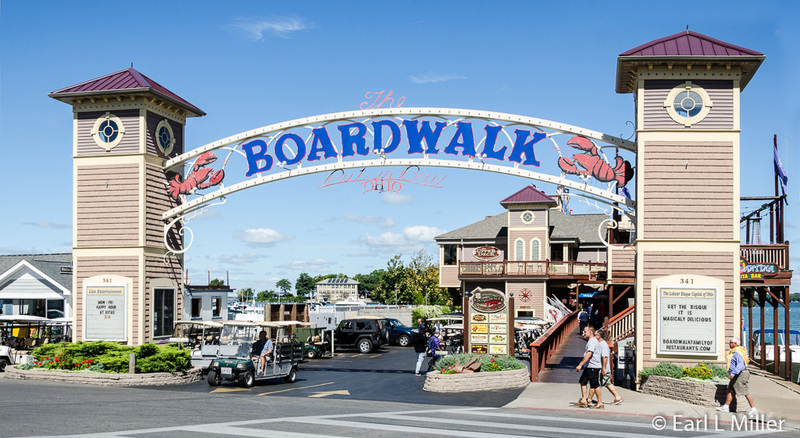 A convenient place to obtain a golf cart is the PIB Jet Dock, the vendor at the end of the pier. The cost is $13 an hour for a cart seating four people. 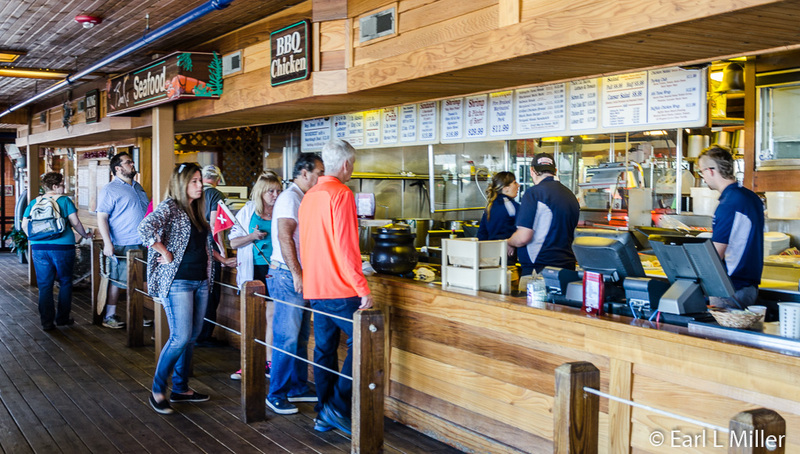 You may want to start your island visit with lunch at the Boardwalk, a wonderful place to have seafood. They offer Maine lobster, Maryland crab cakes, salmon steak, and steamed shrimp. Other options are a teriyaki steak sandwich, grilled chicken breast sandwich, and a marinated pulled pork sandwich. These come with fries and cole slaw. Seating is outside on picnic tables. With the exception of the Maine lobster for $29.99, prices range from $10.99 to $16.99. For slightly higher prices, a more extensive menu, and a restaurant atmosphere, you can go upstairs. If you want to spend more time on the island, there are several options. 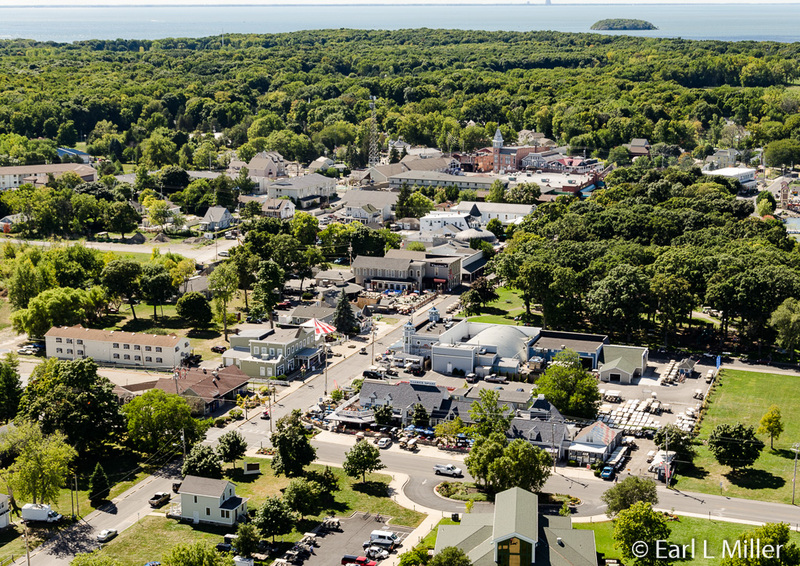 Enjoy walking around soaking up the atmosphere in Put-in-Bay or head for one of several attractions. These include Perry’s Cave, Heineman Winery and Cave (a giant geode), the Butterfly House, and the Chocolate Museum. 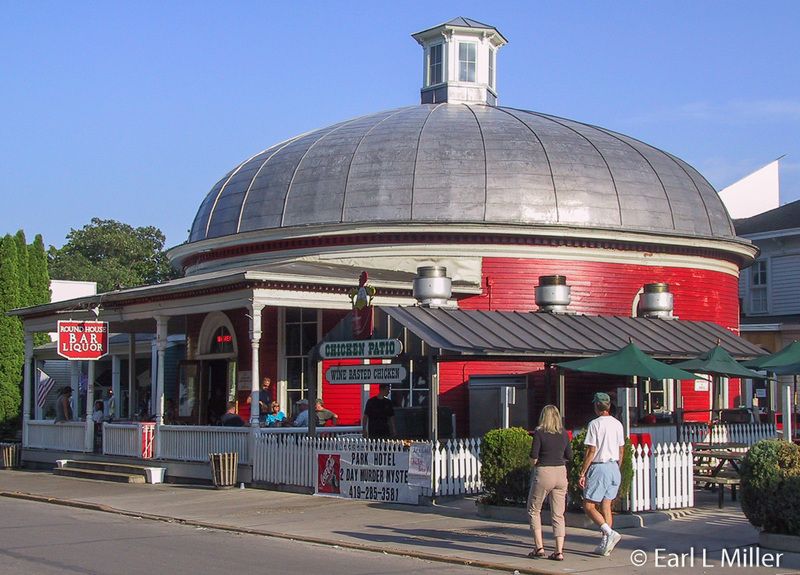 The Chicken Patio, where they serve grilled chicken, and Round House Bar have been landmarks for many years. Sometimes the National Park Service holds special events. This year the National Park Service celebrated its Historic Weekend during the weekend of September 9 through 11. On the 10th, there was a community parade, a patriotic band concert, and a harbor illumination in memory of friends and loved ones. 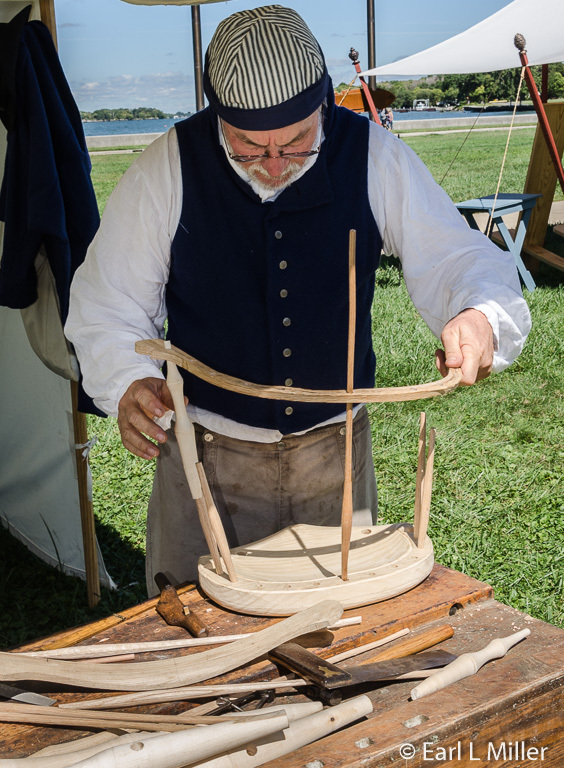 On September 11, numerous reenactors demonstrating crafts could be visited between the memorial and visitor center. Some 50 reenactors representing the War of 1812 could be seen at tents outside the memorial. 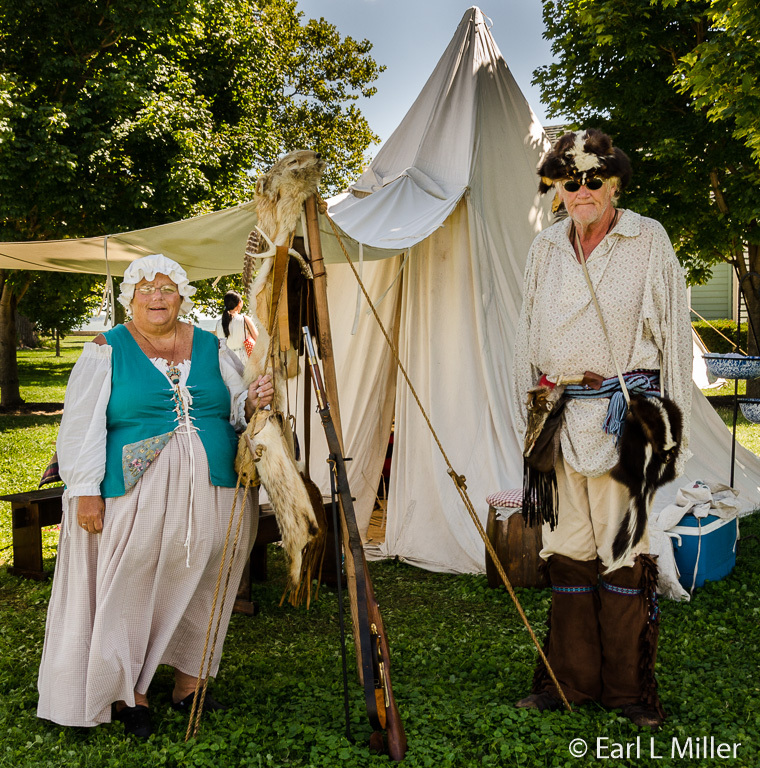 Many participate in similar events in several states with a reenactment almost every weekend during the summer. Sometimes between 70 and 100 people participate. Some come for the day while others camp at the site. Frank Butwin and his son, Ben, were from Perrysburg. Frank portrays Major Amos Spafford. Spafford was postmaster for the Port of Miami, Lake Erie District. In that role he was the inspector of revenues and customs collector. He created in 1796 the first map of Cleveland. He explained that postal rates in those days were by the mileage. For shipments less than 40 miles, the cost was eight cents while for more than 500 miles, it was 25 cents. He also demonstrated how ink in 1812 was made with pokeberries. 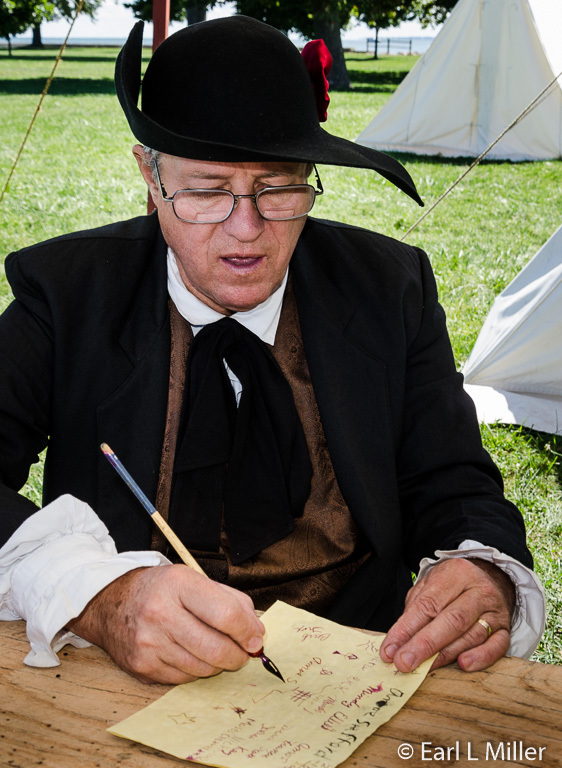 He encouraged those visiting his tent to sign their names by using a quill pen and this ink. Earl accepted his offer. Besides Spafford, Frank also portrays Francis Scott Key and Anthony Wayne. He participates in Revolutionary War, 1812, and Civil War reenactments. Jim Crammond, from Toledo, demonstrated woodworking. He was creating a chair. Native Americans were at another tent. Jeremy Moore, from Bucyrus, Ohio is a Melungeon. Originally there were 400 or 500 members of this tribe in Virginia but now there are only four or five families. He is the last of his relatives. Another Native American was Rolf Granlund from Cleveland. He is a member of the Eastern Woodland, a group of mixed nations which include the Iroquois. Ron and Linda Lermer were from Swanton, Ohio. They represented a fur traders camp. The Lerners portray traders in six or seven events a year at such places as Mackinac City. A highlight was watching a special crew of 14 reenactors fire the three cannons simultaneously. These consisted of a six-pound naval cannon, a 32-pound carronade (replica of one used on the Lawrence), and a three-pound field gun used by the army in the field. The Centerpiece at the Visitor Center - the Statue of Perry.